In 1237, when the Brandenburg margraves concluded the founding treaty for the city, Berlin lay in the wild east. Just like the Wild West in America was colonized, Berlin first had to be brought into the fold of Western civilization. Around 400 years earlier, Charlemagne had taken a first step when he “beat the Saxons so hard on the head that they got flat feet” – as countless generations of school pupils were later to learn as a consecutive clause. What lay behind this were the centuries when the political power centers gradually shifted from Rome via the Rhineland towards the east. On October 28th, 1237, a treaty was signed between the margraves of Brandenburg and the Bishop, the dean of the cathedral and the cathedral chapter of Brandenburg. This put an end to the fight they had been waging for years about the right to levy tithes in a large part of the diocese. On February 28th, 1238, the agreement was conclusively ratified by three arbitrators empowered by the Pope, and certified by their seals and the seals of the treaty partners. The second document, three copies. During the 16th century, the teachings of the reformer Martin Luther came to be accepted in Berlin. Prince Elector Joachim II successfully prevented Berlin from being torn and troubled by religious strife. He declared himself decisively for the Reformation, so that it was introduced as the new church order in Mark Brandenburg in 1539. Berlin developed into a new center of Protestantism. The Thirty Years’ War (1618-1648) swept over Berlin with all its dreadful consequences. The city was devastated several times by imperial or Swedish troops and even by the “soldateska of the Prince Elector”. Both friends and foes laid waste to the land to such an extent that nobody wanted to live there any more. The effects of the war and epidemics caused Berlin’s population to drop from 12,000 to 6,000. Reconstruction began under Frederick William, the Great Elector. To compensate for the huge loss of population he took in religious refugees from many parts of Europe: Jews expelled from Vienna in 1671 and persecuted Huguenots from France in 1685. The Great Elector granted tax concessions to the French immigrants; in the Edict of Potsdam, which he signed in October 1685, he also guaranteed them their own administration, their own schools and freedom to practice their religion. The Huguenots were mainly administrators, tradesmen and artisans, and brought new manufacturing works to Berlin. You can still see the traditions of the French Huguenot immigrants in Berlin today. There is still a French church community; the French Cathedral, whose dome was destroyed in the Second World War and restored in 1983, is one of the landmarks of the city. There are also lots of linguistic reminders in Berlin’s local dialect (for instance, the meat patty usually called “Frikadelle” is known here by the French word “Boulette”). On the “Day of the Refugees” the Huguenots today still commemorate this great prince and his tolerant reign at the statue of the Great Elector on horseback in front of Charlottenburg Palace. In the year 1701, the ruling Elector in Königsberg crowned himself as Frederick I, King of Prussia. Under his rule the royal residence Berlin became the most important city in the new kingdom. In 1709, Cölln and Berlin, with some suburban settlements, were combined into an even bigger city. During the reign of Frederick II, who transformed Prussia into a major power, Berlin became a center of science, culture and enlightenment. This king, who went down in history as Frederick the Great, attracted philosophers, artists and scholars to his court at Sanssouci Palace in Potsdam and profoundly influenced Berlin’s intellectual climate. Frederick II’s exchange of philosophical ideas with the French enlightenment philosopher Voltaire is well known and has survived in their voluminous correspondence. After the German Reich had lost the war, the Kaiser abdicated and the era of monarchy was over. In the succeeding years, Berlin became the scene of fierce fights between Social Democrats and Communists, but also between left and right-wing extremists who wanted to set up a new republic. The Social Democrats won out with their idea of a parliamentary democracy; Friedrich Ebert (SPD) became the first President of the Reich. At this time an important decision was made for the development of the city. A law passed by the Prussian Parliament on April 27th, 1920, joined Berlin with seven other cities, 59 municipalities and 27 manorial districts to form a new, unified municipality called Greater Berlin. Around four million residents lived in an urban area of around 878 sq. km. Berlin developed into a European metropolis. In the brief time between the post-war political unrest and the impact of the world economic crisis, Berlin experienced a cultural heyday: it was the capital for the Golden Twenties with an aura of unbridled excess. Art, cinema, music and newspapers took on an importance we can hardly imagine today. The slump created by the Wall Street Crash hit Berlin extremely hard. Unemployment, tax increases accompanied by wage cuts and social impoverishment led to increased support for the radical parties. Communists and Nazis engaged in bloody street battles. The democratic parties were caught between these two extremes. The Nazis proclaimed the “battle for Berlin” on their way to power. After Adolf Hitler, the leader of the National Socialists, had taken power and achieved a majority in the Reichstag for an undemocratic Act of Enablement, the Berliners also started feeling the consequences of the new regime. Municipal self-government was dissolved and the city administration was taken over by a Nazi “State Commissioner”. The first warning sign was the destruction of the Reichstag staged by the Nazis, which was designed to strengthen their own position. After 1933, Berlin became the center of Nazi terror. The Nazis burned books by authors they opposed at Opernplatz. They had the headquarters of the secret police (Gestapo) here and also the seat of the People’s Court that won notoriety with its cruel sentences that reeked of submissiveness to officialdom. On November 9th, 1938, the city was the scene of the “Kristallnacht”, a pogrom in which synagogues and Jewish shops and businesses were destroyed. Berlin was also the location for the Wannsee Conference on January 20th, 1942, which decided on the barbaric “final solution to the Jewish question”. Today 12,000 Jews now live in Berlin again, many of them from the former Soviet Union. Before the Nazi regime 160,000 Jews lived here. But Berlin was also the starting-point for the resistance against Hitler and National Socialism. There were resistance fighters in the workers’ movement and in the military, in church circles and in middle-class groups. The circle around Colonel Stauffenberg included 89 victims. The attempted assassination of Hitler on July 20th, 1944, was intended to end the war, which had long since been seen as lost. This would have saved a lot of misery in Berlin too. Today we are reminded of this resistance by places such as the Memorial Center at Plötzensee, where many of the death sentences were carried out, and the Memorial of German Resis­tance in Stauffenbergstraße. 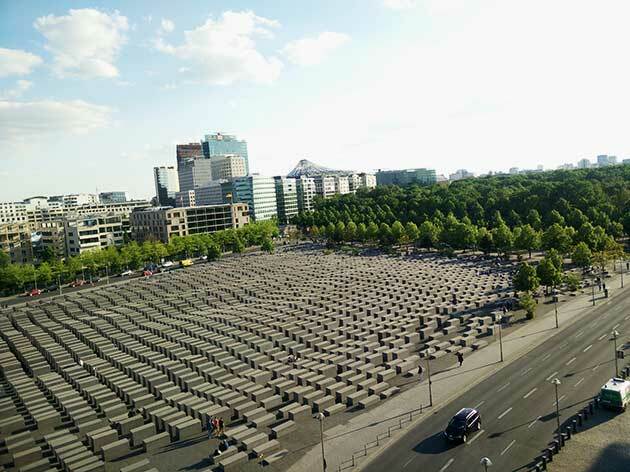 In 1987, another Memorial Center was opened, the “Topography of Terror” on the Prinz-Albrecht Site, which documents the Third Reich’s centers of terror and persecution. The Second World War almost completely destroyed Berlin. The city from which the Nazis had proclaimed “total war” became its greatest victim. When the city capitulated on May 2nd, 1945, following the arrival of Soviet troops, the balance-sheet of the war could be seen: Berlin mourned 800,000 dead and the city was buried under 75 million cubic meters of rubble – a seventh of all the war rubble in Germany. There was no electricity, no gas, and running water only in a few places in the outskirts of the city. Food supplies were largely controlled by the black market. With the onset of winter, wood and other fuel also became scarce, so the Berliners had no choice but to chop down trees in parks and avenues. During the war, the “anti-Hitler coalition”, composed of the USA, Britain and the Soviet Union, had already agreed in principle what should happen to Germany afterwards. After the war ended, France also joined in the existing agreements. Germany was divided into four zones of occupation which were administered separately by the Four Powers. A special arrangement was envisaged for the former capital of the Reich: the area of Greater Berlin was to be occupied and administered jointly by all Four Powers. Berlin was divided into four sectors: an American, a Soviet, a British and a French sector. On October 20th, 1946, under the supervision of the occupying powers, free elections for the municipal assembly were held in the whole of Berlin for the first time since the war – and the last time until the fall of the Wall. The democratic parties conducted the election campaign with the declared aim of abolishing the municipal and local administrations set up by the Soviet military government in 1945, which were under communist influence. The Social Demo­crats won 48.7% of the valid votes, the Christian Demo­crats 22.2%, the Socialist Unity Party 19.8% and the Liberal Demo­crats 9.3%. An impressive 92.3% of those eligible to vote did so. The elections were a clear vote against the Soviet Union – even in the Soviet sector the Social Democrats received half of all votes, and the Socialist Unity Party, which had been created under pressure, received only a fifth. Opinion in East Berlin attributed this to ”pressure, anti-com­mun­ist propaganda but also false promises”. On the same day, the consti­tution of Greater Berlin passed by the Allies came into force. The People’s Rebellion in 1953 made it clear how the conditions were in East Germany during the first years following the inception of the German Democratic Republic (GDR). On June 17th, 1953, in East Berlin and East Germany, people’s dissatisfaction with the political and economic system in the GDR came to a head with demonstrations, strikes and protests. The rebellion was brutally suppressed and the Soviet Union, by intervening with force, had made it clear that it was not prepared to allow a change in the political and economic sys­tem in the GDR. In 1955, the era of occupation ended in the Federal Republic of Germany. The German Treaty now came into force. The western powers only retained rights for “Germany as a whole” and for Berlin. In parallel, in a declaration on May 5th, 1955, the western powers affirmed that Berlin should exercise its rights, authority and responsibility – as envisaged in its constitution from 1950. What remained in force were the Allies’ legal powers and provisos on questions of the status and security of the city. In the same year, the GDR was also granted “sovereignty” by the Soviet Union. Thanks to the help of the American Marshall Plan, reconstruction in West Berlin went much faster than in the eastern part of the city. This situation and its generally higher living standard made West Berlin a “showcase for the West” in relation to the east bloc. In 1958, the Soviet Union tried once again to change this critical situation. In a diplomatic note known as the “Khrushchev ultimatum”, the chairman of the Soviet Council of Ministers demanded that the western troops withdraw and that the western sector of Berlin be transformed into an “independent political unit – a free city”. He set a deadline of six months, after which he would hand over the control of all access routes from West Berlin to the GDR. The western powers firmly rejected the Soviet demands. After the Soviet Union had been forced to accept that it could not solve the Berlin question the way it wanted against the opposition of the western powers, it considered other possibilities. It was under great time pressure. Every day many people fled from the GDR and East Berlin to the western sectors of the four-power city of Berlin. In 1961 alone, 200,000 people went to the west; 152,000 of them via Berlin. They were mainly technicians and skilled workers. In the night of August 12th/13th, 1961, the GDR closed the border, which had still been open at that point. A fortification made of barbed wire, concrete slabs and stones was erected around the western sectors of Berlin. Eastern “People’s Police” and Socialist Unity Party combat groups guarded this border in the days that followed until the Wall itself was finally built. Families were forcibly separated by this, merely because they lived in different sectors. Overnight, workers could no longer get to their workplaces in the western sector. Within a very short time, the links joining the two parts of the city were severed; the GDR walled itself in. Although they risked their lives trying to cross the Wall from east to west, people contin­ually tried to escape. These dramatic attempts often ended brutally with shots by GDR border troops. In the following years, until the fall of the Wall, 152 refugees and people trying to help with escapes lost their lives in Berlin alone. Especially after the building of the Wall, the city was trapped in the middle of disparate viewpoints of east and west. Visits by heads of government of the western powers turned into impressive demonstrations by the Berliners for the western alliance. To allow separated families and friends to visit each other, the Berlin Senate signed an agreement with the GDR government for frontier-crossing permits. From December 1963, this made it possible for West Berliners to visit the eastern part of the city on Christian holidays. In these agreements both sides left aside questions of legal status and irreconcilable questions so as not to destroy the chance to relieve human suffering. At the end of the 1960s, the international political climate became more settled. The power spheres of both blocs had become entrenched during the postwar years. The precondition for the politics of detente was the mutual recognition of existing relationships. For the Federal Republic of Germany, which was willing to go along with the Western allies in respect of the politics of detente, this meant making concessions on the question of the realities established after the Second World War. The social-democratic government of the time under Chancellor Willy Brandt concluded the “Moscow Treaty” with the Soviet Union on August 12th, 1970. This acknowledged the postwar borders as inviolable and as reality in the sense of non-aggression. But the Federal Republic specifically mentioned the reunification of Germany as a long-term aim. In return for this acknowledgment of realities the Federal Republic could expect the Soviet Union to make some concessions on the Berlin question. With the Four-Power Agreement on Berlin signed on September 3rd, 1971, the four powers, regardless of their different legal positions, instituted practical regulations that secured and improved access to Berlin, strengthened the city’s bonds with West Germany and made Berliners’ lives and communication with their surroundings easier. The treaty left untouched the four-power status for the whole of Berlin, and the original legal principles were also retained in full in the areas in which new regulations had come into effect. The position of the three western powers in the western sectors was confirmed and strengthened. Berlin was a city with different social systems. East Berlin was the capital of the GDR and West Berlin the guarantor of Europe’s freedom. Each of the two halves of the city developed separately. The politics of Michael Gorbachev – glasnost and perestroika (the openness and reconstruction of democratic structures) – brought the chance of uniting Germany once again. By the end of 1988 at the latest, it had become impossible to ignore the demands for freedom of speech in the GDR. There was some relaxation in the cultural arena – for the first time artists from the GDR came to West Berlin for the 38th Berlin Festival – but the basic political contradictions were still there. While Soviet politicians were advocating more openness and liberality, West German politicians remained more reserved and appeared surprised when, on his visit to Berlin on June 12th, 1987, US President Reagan demanded in a speech in front of the Brandenburg Gate that President Gorbachev pull down the Wall. In the summer of 1989, a mass exodus started from the GDR. Via the West German embassies in Budapest, Warsaw and Prague, people came to the Fed­eral Republic in special trains. Continuing the peaceful revolution, in September 1989 the Monday demonstrations began in Leipzig with the slogan “We are the people”. 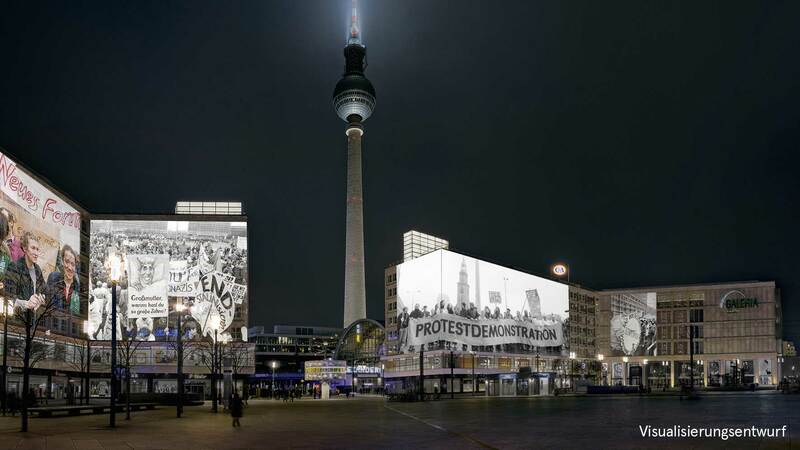 On November 4th, the biggest demonstration was held in Berlin between Alexanderplatz and Marx-Engels-Platz. Between 500,000 and 800,000 people demonstrated for freedom and democracy, for “socialism with a human face”. Meanwhile the politicians were making their first attempts at reform. Party boss Erich Honecker was replaced by Egon Krenz. On November 9th, 1989, Günter Schabowski announced rather casually at a press conference that the government had decided to allow East Germans the freedom to travel. This led spontaneously to the opening of the Wall that same night. That night huge crowds of East Berliners flooded into West Berlin. Complete strangers threw their arms around each other; the euphoria was unimaginable. But nobody was more surprised than the political leadership in West Berlin and the Federal Republic. The Chancellor, Helmut Kohl, was on a state visit to Warsaw. The next morning, he broke off the visit and rushed to Berlin to stand with other politicians on the balcony of Schöneberg Town Hall – the same balcony where John F. Kennedy announced he was a Berliner – and sing the German national anthem: “Unity and justice and freedom are the basis of happiness”. Hans Modrow became the new prime minister of the GDR, politicians and civil rights activists sat together at the Round Table, and on March 18th, 1990, the first elections after the fall of the Wall were held in the GDR. In February 1990, after a meeting with Michael Gorbachev, Helmut Kohl announced that it was ”the sole right of the German people to decide whether they wanted to live together in a single state”. The ”Two-plus-Four Talks” (involving the foreign ministers of East Germany, West Germany and the Allies) prepared the unification process. October 3rd was declared the day of German unity. On December 2nd, 1990, the first elections for the whole of Germany were held. The city started to fuse together. Within a very short time, there were no traces left of the initial euphoria. The structural reforms, the dismantling of factories in the GDR and their incorporation into the western economic system led to high unemployment. Dissatisfaction grew. But 30 years after the fall of the Wall, we can see clearly that this historical fluke, the establishment of a reunited Germany 45 years after the end of the Second World War, really is and remains a historical stroke of luck. This luck had to be painstakingly woven together in the jungle of the double city of Berlin that had grown up over the years. Streets that had been divided by the Wall were opened again, train lines were brought together, telephone cables patched up, the water and electricity supply linked together. In the years since reunification, Potsdamer Platz, which had become a dreary wasteland, was rebuilt with a massive investment program and has become a new urban center of the 21st century. Friedrichstraße has developed into a shopping precinct comparable to Kurfürstendamm, and a government quarter has emerged that has transformed the area between the Reichstag and Schlossplatz into Berlin’s “living room” once again. Between the Hackesche Höfe and the New Synagogue a quarter has grown up, an area full of Jewish symbolism and meaning, that is unparalleled in postwar Germany. The golden dome of the New Synagogue is now one of the city’s landmarks again. In the metropolis on the Spree once enclosed by the wall, in the legendary RIAS radio program from “the city at the front”, “The Islander”, they used to say that the island of Berlin might become a mainland once again. 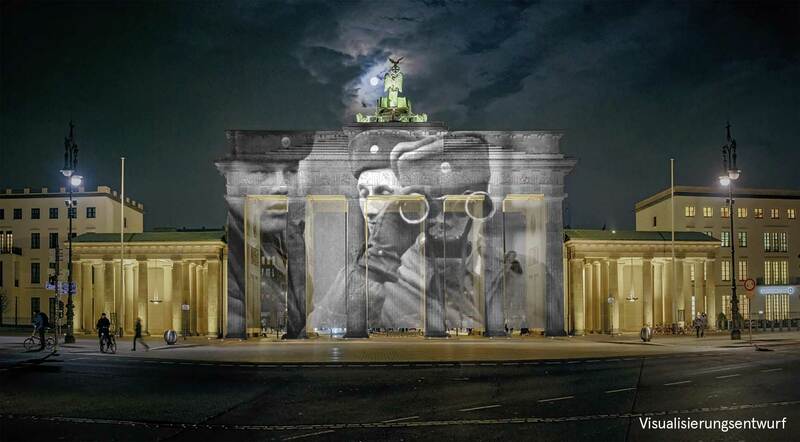 On Berlin’s 750th birthday in 1987, people said: “One city, two worlds”. Today you could say “one city, many worlds” – from the local neighborhood in Neukölln to the shopping precincts at Potsdamer Platz, from the industrial locations in Siemensstadt to the Turkish bazars in Kreuzberg, from the patterns of Jewish life in Mitte to the flair of a metropolitan city around Gendarmenmarkt, from the museum metropolis between Museum Island, Charlottenburg Palace, Cultural Forum and all the new galleries right up to the government quarter with its old and new embassies. On June 20th, 1991, the German Bundestag reached a decision to relocate its Parliament and seat of government from Bonn to Berlin, and the center of political decision-making shifted accordingly. Berlin has officially served as capital since the “Federalism Reform” in 2006 when it was established in Article 22 of the constitution. 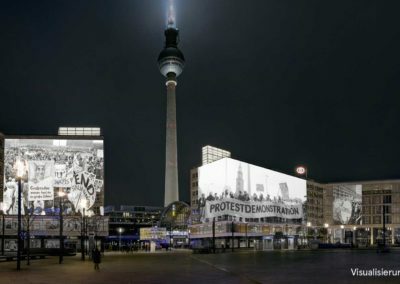 In the meantime, a continuous stream of organizations, associations and institutions are resettling their headquarters here or at least setting up a Berlin branch. Nearly 12 million tourists per year are good indications that Berlin is developing nicely as a multi-cultural metropolis. 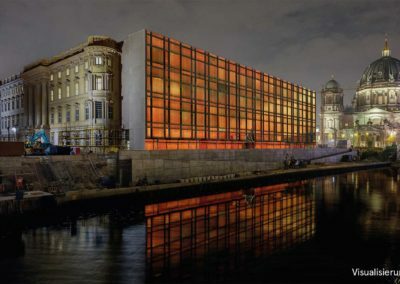 Certainly Berlin’s positive transformation into a financial, academic and trade fair center has contributed to its success in the area of tourism. 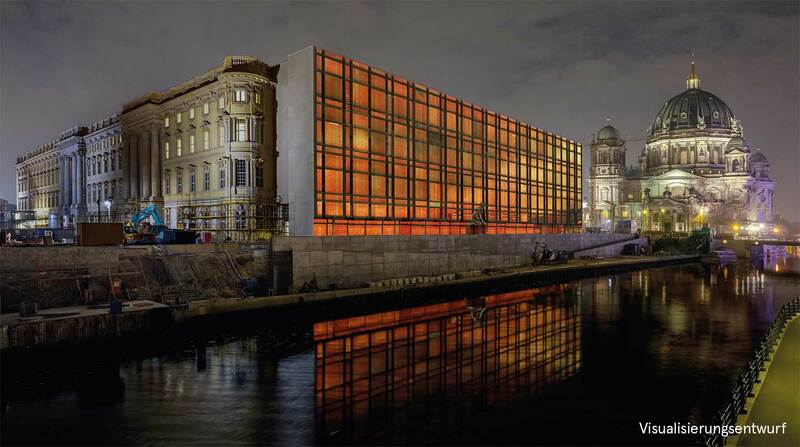 Last but not least, Berlin’s blossoming art scene, new media and music industry are a few added bonus incentives for people all over the world to come visit, or even to live and work here. 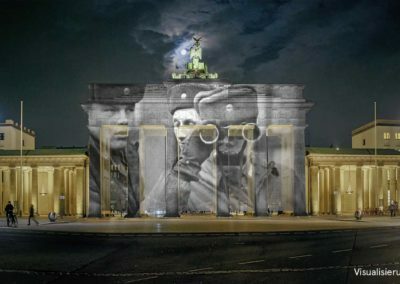 In 2012, the city celebrated “Berlin turning 775”. Twice before in 1937 and 1987, the city had honored its local history for the third time. Four years after the National Socialists seized power in 1933, they bastardized the city’s 700th anniversary for propaganda purposes. Those festivities lasted a full week. It took place mainly outdoors and was focused primarily on the Berliners themselves. 50 years later in 1987, the media would feast on this nationally covered spectacle and hone in on the varied vantage points of East and West Germany to compare their versions of history. As was the case in 1987, the latest celebration lasted all year round and featured different events, presentations and exhibitions. The topics ranged from “The Medieval City” to “The City of Variety”. Several extraordinary excavation sites from the last few years were open to visitors last autumn before being overbuilt with new streets, squares and buildings. With noticeable temporary markings, the original medieval merchant’s quarters of Cölln and Berlin became a joint district. These recreations of medieval places gave us a glimpse of the city’s roots. Nowadays, people from all over the world shape the face of this open-minded metropolis and they play a decisive role in adding to Berlin’s appeal simply through their diversity. An estimated 3.5 million Berliners hail from over 190 countries worldwide. The “economic miracle” during the 50’s attracted guest workers – Turks being the majority – but also from the Mediterranean region. The division of Germany led to widely varying developments for labor migration in East- and West Germany. In the GDR, two-thirds of the so-called “contracted workers” originated from Vietnam. While the German industries in the east and the west were actively recruiting workers from abroad, a new front of economic and political refugees started trickling in; primarily seeking a brighter future in the west. “Nobody becomes Prussian except through dire need…”, proclaimed a pamphlet from the 18th century. What the religious refugees from France (Huguenots) and Bohemian Protestants experienced is comparable to the refugee situation of our day. Berlin will be faced with huge challenges for years to come. They don’t need to spend two thirds of state revenue, as Frederick William once did for integration measures. It’s clear that integration is an ongoing process that requires the support of many institutions and individuals. Even a flourishing metropolis like Berlin must confront these challenges head-on or deal with decades of negative repercussions. In the years of the economic miracle, Germany had recruitment agreements with several European, African and Asian countries. Upon reunification, 220,000 Jewish quota refugees came to Germany from former Soviet satellites, of which 30,000 landed in Berlin. Two examples that illustrate how roughly one million of Berlin’s 3.5 million ­populace boast a migrant background. There’s no denying, the road ahead will bear many obstacles. Examples throughout history have shown that we can manage for the good of all. Berlin has always been an open and tolerant city, so why can’t she stay that way.